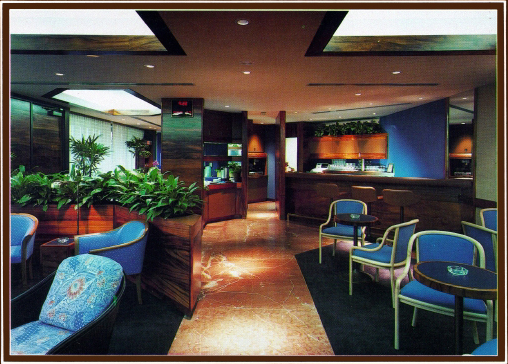 AMERICAN AIRLINES ADMIRALS CLUB. 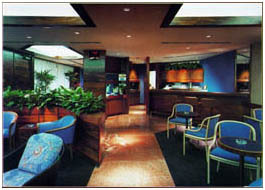 This lounge area in the Honolulu airport is designed to be as durable as it is beautiful. 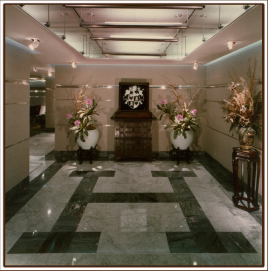 The main traffic corridors are paved in Corinthian marble in roan with beige veining. 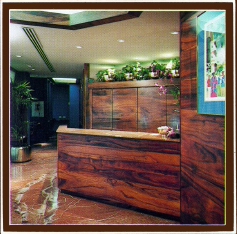 This color coordinates with the native koa plank paneling. The upholsteries feature pacific colors and textures including Indonesian batique prints in blue and white. The art and artifacts displayed are a combination of local paintings from artists living in Hawaii and Hawaiian antique artifacts on loan from the bishop museum. 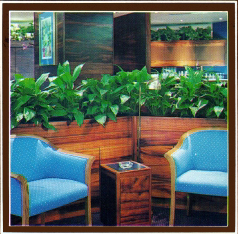 This decor encourages the traveler to Hawaii to learn a bit about the crafts and lore of Polynesia, while awaiting their flight. 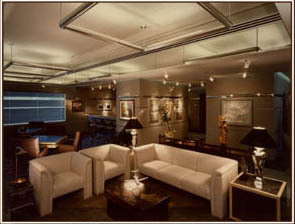 HEMMETER AVIATION LOUNGE. 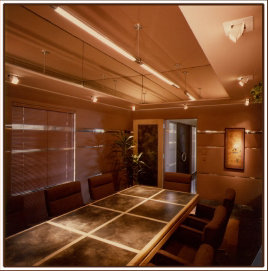 This facility provides waiting and meeting rooms for private aircraft and the Concorde. The luxurious interiors feature upholstered walls inset with polished chrome, soffits edged in mirror reflecting the "floating" chrome light tubes, and "high-tech" accent lights that pull down from the ceiling to pinpoint the collection of art and antiques.